As a disclaimer, I will tell you that this show was the one I was most looking forward to at the Fringe this year. And since I’m listed in the special thanks in the program its fair to tell you that Jon Kovach is my friend. Regardless his last two pieces, NOTHING and THE WAVE, have been Fringe highlights for many and when I heard he was taking on a piece that featured more than one actor I was excited. He is the kind of person who seeks a challenge; adapting this material couldn’t have been easy . . . but it appears that the risk has paid off in spades. BLOGGING BEHIND BARS is the real story of Whitney Smith, a convicted felon from Cincinnati, Ohio, who would write his father letters that were then posted on a web site blog (sorta like this one!). It won several awards and the writing is stunning. Smith’s father, Jeff, was looking for someone to tell his son’s story and Unity Productions is the perfect kind of outlet for a story such as this. Smith was in attendance for opening night, as were others in the Smith family, and the energy was palpable. TJ Ganser stars as Whit, and seems to capture the spirit of his writings with his enthusiasm and playfulness. 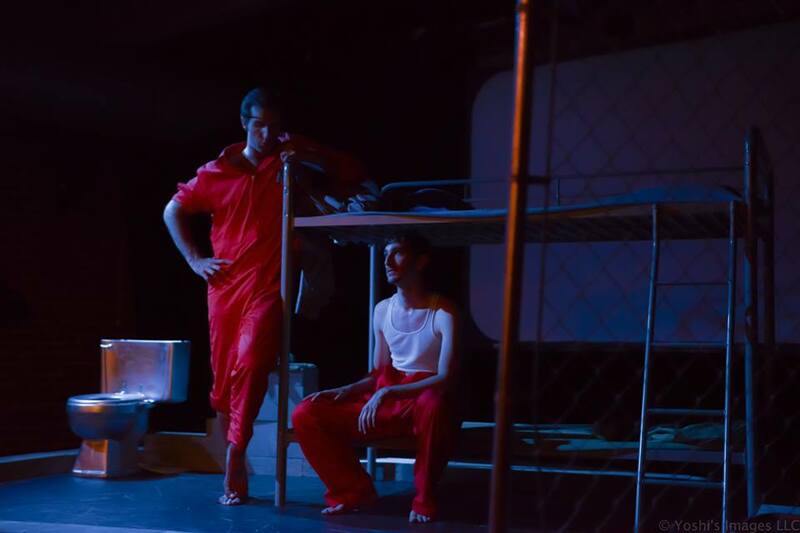 “Bryan,” Whit’s cell mate, is played by recent Xavier grad and LCT Rising Star winner Patrick Phillips. Phillips is a solid actor, though it was hard to hear him at times. I thought that he really shone in one particular scene, though, where he became hurt by Whit’s perceived disloyalty. Phillips has had a very good year and I can’t wait to see what both of these young men accomplish after they spend the next season working as interns at Ensemble Theatre Company. The rest of the cast supports the two main players nicely. Rico Reid plays the African American character, “Diggity,” with an understated restraint. Ashley Dunn and Matt Dentino were excellent in their portrayals of Whit’s attorney and Jeff Smith, Whit’s father. Justin Spencer looked precisely as I would expect a prison villain to look and his menacing stance and facial expressions when his character was first introduced was some of the best non-verbal acting I’ve seen live anywhere. I can’t find fault with any of the performances, though I do hope that they can find the balance of playing towards the intimate, very close front row all the way to the back of what I suspect will be ongoing sold-out houses. I had the privilege of seeing Jeff Smith, father of the protagonist, interact with the audience, the cast, and others after the show was over. He was gracious, kind, and genuinely seemed pleased with the outcome. If he liked it – and its his son’s story – then I can’t imagine how anyone could not be moved by this piece. I know I was. The buzz from everyone I talked to was positive; I even heard someone say that they think its one of the better Fringe shows they’ve seen in a few years. High praise, indeed! Not only does this show inspire a lot of feelings about fatherhood and families it also tackles the topic of prison reform, which as far as I know makes it unique among this year’s offerings. Kudos to Unity Productions, the cast, the crew, and the Smith family on an amazing show that I highly recommend.